Searching for an experienced, reliable glass retailer? Glass Impressions	can assist you with all your glass needs! From repairing a windshield	to installing new windows for your home, we are your one-stop-shop. All	of our technicians are National Glass Association (NGA) certified and	knowledgeable about our products. We also offer free estimates! No matter how big or small the job is, we at Glass Impressions are able	to meet all your glass needs and are committed to providing prompt, friendly	service at a competitive price! With our many years of experience, our unbeatable prices, and our dedication	to efficient, friendly service, why go anywhere else for your glass needs? Call us today at (410) 796-7776 to learn more and for instant scheduling! How can we help you with your glass needs? Do you have one of those pesky chips in your windshield from a rogue rock? Glass Impressions offers rock-chip repair so that tiny little chip doesn’t	end up making you have to replace your whole windshield! Do you need to replace the whole windshield (or perhaps a window)? We can	help! We accept all insurances and offer 24-hour emergency service. We	are the leader in Maryland windshield replacement and repair. Want to update your home with insulated windows, custom wall mirrors, or	other glass features? 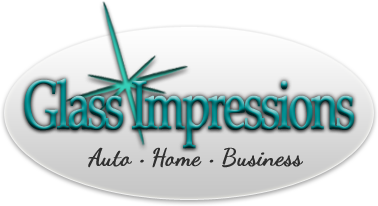 Glass Impressions offers complimentary in-home estimates	for all your project needs. Whether your business needs a broken window replaced quickly or is looking	to remodel, we can help! We offer same day servicing for any breakage	of glass and provide a variety of commercial glass options for renovation	and remodeling projects. Do not delay in repairing that chipped windshield, updating your home,	or remodeling your business with new glass features! No job is too big	or too small, and with more than 15 years of experience, Glass Impressions	is the right business for you. Contact us at (410) 796-7776 to learn more and to get a free consultation.